Thank you for visiting Magi Films website. 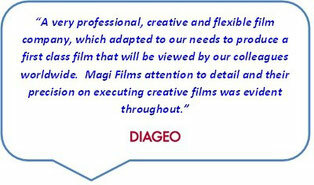 Magi Films is a vibrant independent, creative, commercial media and film production company based in Scotland. For the last decade, we have specialised in delivering high quality films designed to meet specific requirements of our clients. Over the years, our creative and innovative approach has enabled numerous businesses in private and public sectors to showcase and highlight their products nationally and internationally. We provide our clients with an all-inclusive or a la carte service, including digital media, creative and production. As a versatile company, we passionately create visual products to meet our client needs. Our experienced production team, shares the passion of its clients, enabling us to plan and create unique films for their businesses. In doing so, a 100% client satisfaction service has been achieved. The highest calibre of expertise is given to all projects to ensure that every film is produced and edited to the highest standards. For further information, please browse our website or contact us. We look forward to working with you!